Your ecommerce store is your shining star, your magnificent creation, your ace-in-the-hole of your business life. Having an ecommerce business allows you to sell your goods and services 24/7/365. It doesn’t tie you down to a specific location or incur the costs of a brick-and-mortar store. It gives you flexibility to live your life outside the 4 walls of your business. It gives you a global presence that was not available just a few short years ago. The amount of revenue generated through ecommerce is pretty staggering! Now for an even more staggering statistic that’s not so good. The global average rate for 2016 was 77.24%, which means that a little over ¾ of shoppers who added items to their carts ended up not making a purchase. With these stats, sales lost to abandon carts estimates about $228 billion dollars. People that almost bought your product, bailed at checkout. There are many reasons that people leave their products in their cart and walk away. They got distracted – either an online bright shiny object or they had to take their dog out for a poop. The process took too much time. 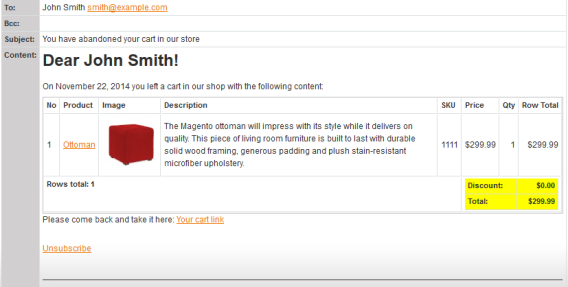 Your site didn’t take their credit card. Security issues up with this one. People didn’t see the shipping cost and sales tax before they placed their order. Unexpected “fees” are a killer. 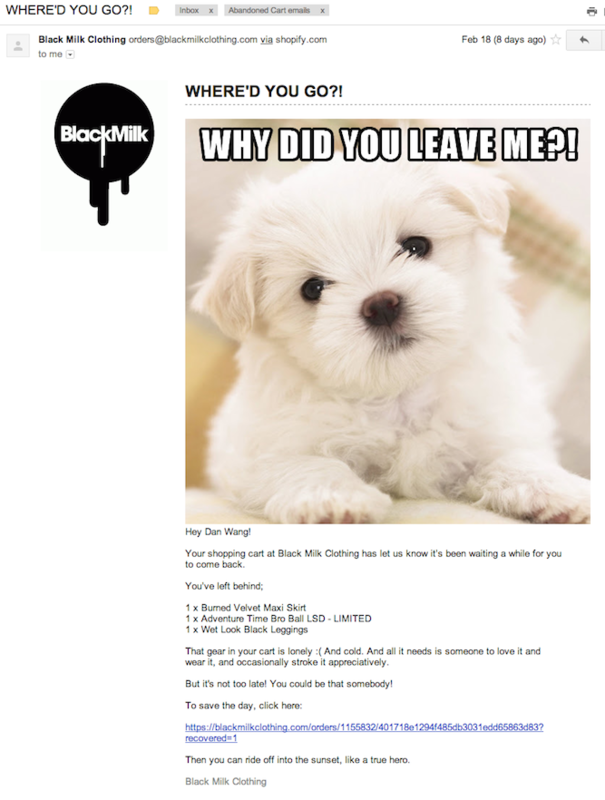 Whatever their reason, that order, that precious potential new customer abandoned their purchase of your products. This can trigger emotional effects as well, which can make you question why you’re in business in the first place. Yes, all from seeing the abandoned cart message on your ecommerce dashboard. We’re going to apply a little Hero Worship. What I mean is, we’re going to put the customer first. When we think of nurturing our customers, it usually happens when we are trying to get them to buy, or to get them on our list. Great copy and product descriptions on your site may make prospects and new customers feel warm and fuzzy, but if something goes wrong and they abandon cart, the nurturing stops there. 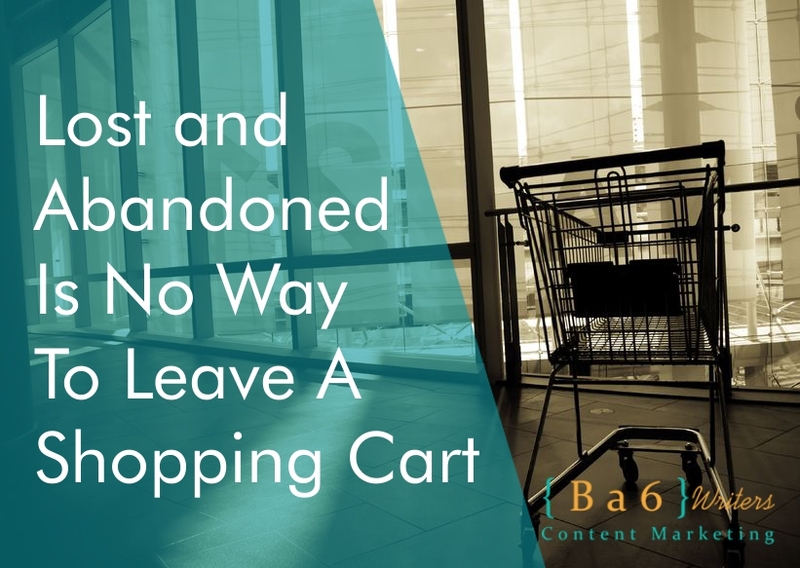 If you abandon your customers that abandoned their carts, you’re telling them it’s really not worth your time to win them back. But, win back you must! Were you ever one of those kids on the playground that didn’t get picked to be on a team for kickball? Maybe you were the last one picked because you were the only one left – remember the eye-rolling when the captain had to pick you? Or, maybe you didn’t get asked to the junior high dance, and felt left out. I may be exaggerating a little, but this is a little how your abandoned cart customer feels when you don’t “go after” them. When you take the extra time and give a little personal attention to these almost lost customer, you’re telling them that they ARE worth it and that you DO value them. 1. Make sure you look at abandoned carts daily. Locate it on your ecommerce dashboard and know when those failed orders happen. …to a personalized message, in your brand voice, that catches the customer’s attention and whisks them back to their cart. 3. And always give them a reason to stay! I’m not big on teaching customers to wait for discounts and special offers, but in the case of abandoned carts, you do want to ease their stress and build trust. Give them a one time “sorry for your trouble” discount or add a special bonus in their box. Abandoned carts are not a lost cause! They are a way for you to step up your Hero Worship and nurture the sh*t out of them. You’ll make them feel like they were your first choice for the kickball team!